Better yet would be to run power and ground up and down as well. 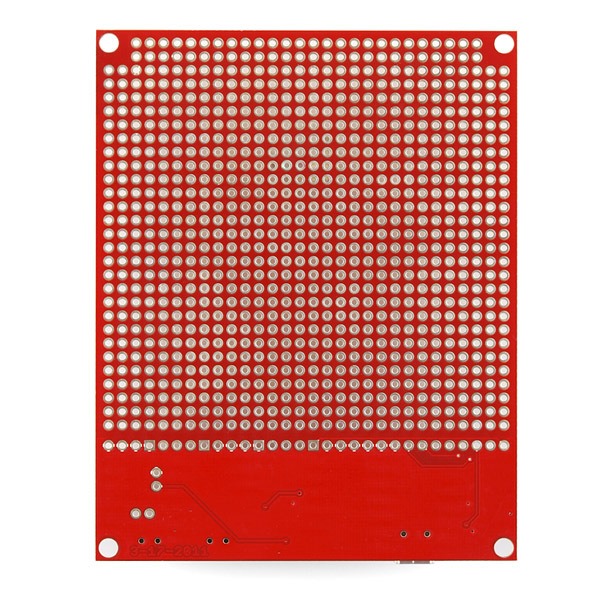 Or holes like this board would be great... https://www.sparkfun.com/products/8813 ... The extra 2 holes on each pad are great for 32 AWG wire. The large pads are also great for SMD. +1. same reason I don't like the Sparkfun proto shields,I use lots of DIP ICs and they are so much easier to use with at least a small breadboard-style area on the board. Even with descrete components you can usually arrange these better with some tied-together holes. A board that does this is the RadioShack 276-168 board here: https://www.radioshack.com/product/index.jsp?productId=2103800. However, I do like the circuitry that SparkFun has on this one, just not the individual PTH holes. Thanks for the tip about the RadioShack board. 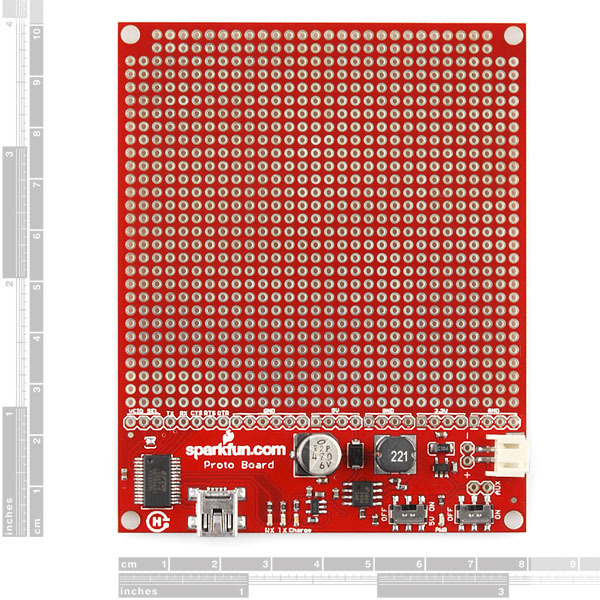 I've been using the protostack board (http://www.protostack.com/boards/prototyping/prototyping-board-half-size-style-1) which is similar and maybe slightly better but takes a full month to arrive in the US from Australia. When I run out of my supply I'll give the RadioShack one a try. It's hugely useful to have just a board with the holes tied in groups and a +/- rail. 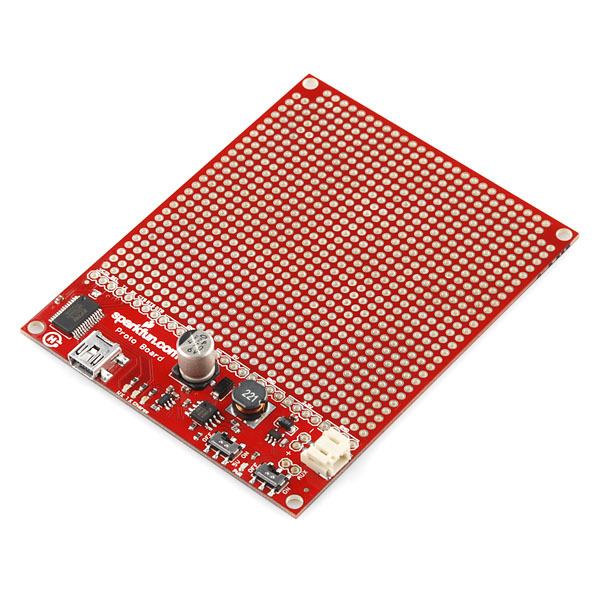 Perfect for project using arduino mini + other small modules and discrete components. Maybe Sparkfun should consider distributing the protostack. These are MUCH nicer than the Radio Shack boards. The holes are plated through with pads on both sides, so they are a lot less likely to come off with to much heat(plus you can solder from the bottom or top). If you use solderless breadboards, the layout on these matches them so you can easily transfer a circuit from one. Thank you so much for the tip about the Adafruit boards! They are definetly much better than the RadioShack boards. I have had that problem once before with the traces falling off. The PTH are much better. SparkFun should consider selling some of these. Seriously, I'd love to have a board with just the lipo charging circuit with 3.3v and 5v out at the same time. (and charging over USB). If you tie the pins together, I will NEVER buy another one... Soldering pins together is NOT a big deal... And the board layout is MUCH more flexible as it is. I like the board since it has a lithium battery charger IC. 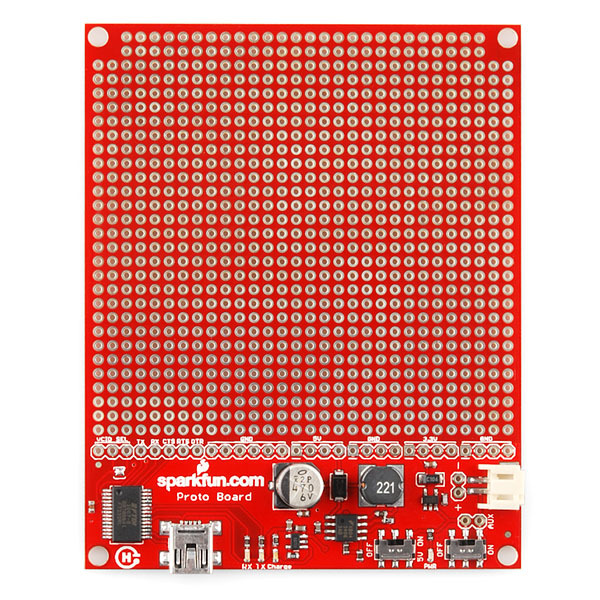 Unfortunately, it is too small for the project that i would like to build, so it would be nice if Sparkfun offered the MCP73831 on a breakout board. 5/4/14 never mind, I just saw the USB LiPoly Charger board in the new product section. If you tie the holes together, let me know so I can buy my boards elsewhere... I'd much rather connect the required holes together with bus wire than fight the process of using a blade to seperate unneeded pins. That data sheet is slightly outdated, but overall the information is still helpful. Thanks for catching that! Could you make a version of the board like Member #40762 describes where the pins are connected similarly to the RadioShack board described here: https://www.radioshack.com/product/index.jsp?productId=2103800. Would help us people who can't do anything with the individual PTH holes. Thanks.